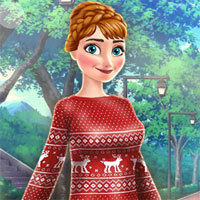 Despite spring has already began, Anna is still into winter. As her sister Elsa, Anna can't get enough of snow and cold. But, you know, new season – new you! So Anna decided to make total refrashion! For her room and her wardrobe. First of all let’s clean up this mess and remove all the stuff that reminds princess about winter.